For Mother’s Day this year I wanted to create something sweet but also very fresh to celebrate spring and the sunnier days, little did I know that these Vegan Pineapple & Lemon Mother’s Day Cakes would become one of my favourite flavour combos! This recipe is very easy to make and does not require any extravagant ingredients – plus it is a nice change to the chocolate cakes I normally make for this occasion. Instead of lemons I like to use lemon extract, the flavour is much more concentrated and it will take your cakes to an all-new level! But use fresh lemon if you prefer it will taste really delicious too. 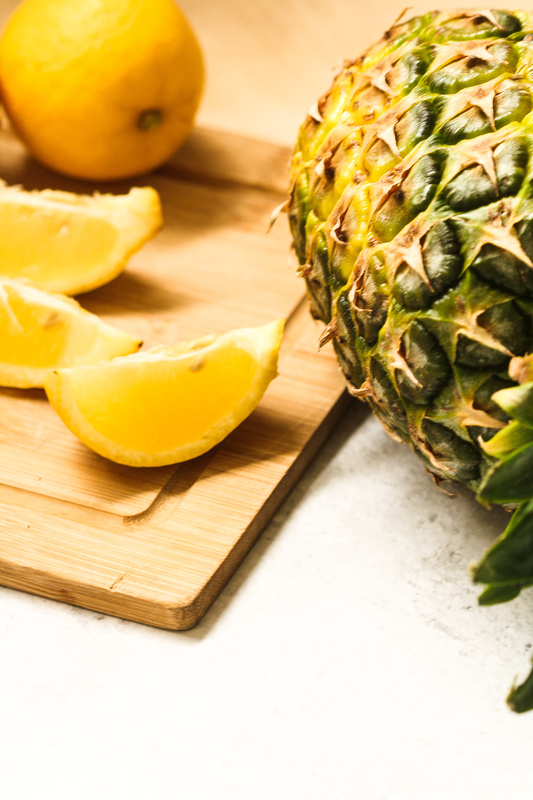 To tell if a pineapple is ripe try pulling one of the inner leaves, if it comes easy then it is a sign the pineapple is ripe. The sweet smell should also be a good indicator. I like to sweeten these Vegan Pineapple & Lemon Mother’s Day Cakes with coconut sugar, just because coconut and pineapple take me to some sunny part of the world, but unrefined cane sugar will do as well 😊. I would recommend you add some coconut whipped cream on top of your cakes. I didn’t do it this time but I think it will make your cake look so pretty. If you don’t have time to make some coconut whipped cream you can simply buy a coconut yoghurt and pipe it on top of your cake (I love the one from the Coconut Collaborative). Before you do so make sure you have left your yoghurt enough time in the fridge so that it holds perfectly on top of your cakes. You can also mix a little vanilla to add extra flavours. 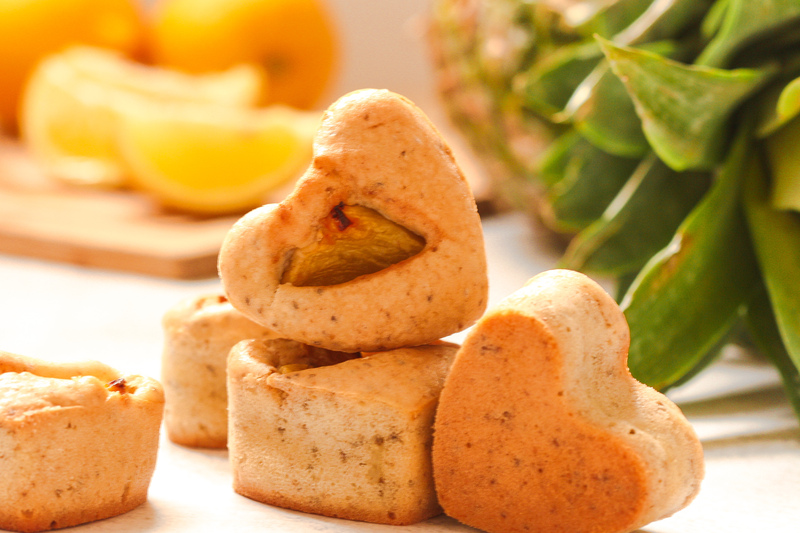 I hope you try and like these these Vegan Pineapple & Lemon Mother’s Day Cakes, if so let me know! Share on Pinterest and tag a photo on Instagram #mimies_delicacies so that I can see your lovely creations as well as helping me reach more of you lovely people. Merci my friends! These easy to bake litlle cakes are both sweet and a little tangy which makes them the perfect treat at the end of a meal. 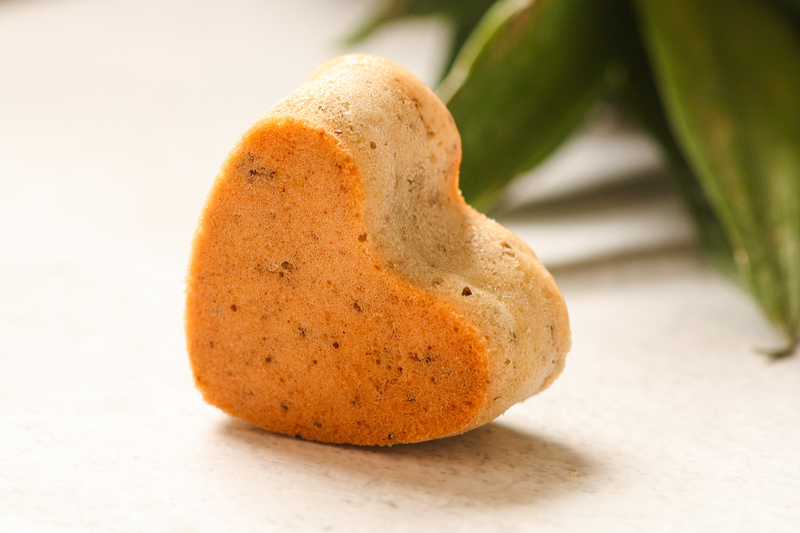 Grease your heart shape moulds (or little muffin moulds) with oil and preheat the oven to 180°C. Chop your slices of pineapple into little triangles, leave aside for later. Cover the chia seeds with water (1cm over the surface) and let them sit for about 5 minutes. In the meanwhile, sift the flour in a bowl (this step prevents any lumps or impurities from going into the batter) add the baking powder, coconut sugar, salt and mix. In a separate bowl, stir together the dairy-free milk, oil, lemon and vanilla extract. Add the chia seeds making sure to mix thoroughly as they tend to stick together. Add the wet mixture over the dry ingredients and stir until evenly mixed. Divide the batter into each mould. Insert a pineapple triangle in the middle of each cake and place in the oven for 20 minutes until golden brown.